When the season starts to turn from summer to fall in Vancouver, many of us turn our thoughts to the edible mushrooms that begin to pop up right as the rain sets in. It varies from year to year but mid October has been a pretty great month for the much-celebrated chanterelle harvest over the past few. Today we’re taking you on the road in search of this mighty orange mushroom that everybody’s talking about! As fall arrives in British Columbia, so do these wonderful mushrooms! It's no secret that the Gulf Islands are ripe with edible fungus. BC Ferries is your gateway to mushroomville (Galiano, Mayne, Pender and Salt Spring Islands are all safe bets). Some of these shown here are edible and some are not. Thankfully for us amateur shroom foragers, Harbour Publishing does a pocket sized field guide to them all. Bring it. It could save your life! If you're lucky, locals will share secret spots with you (just ask). When that fails find any trail and follow it. Look for orange under fir and hemlock trees and when you see it head into the brush! Once you find one, keep to the general area where you found it. There are bound to be many more in relatively close proximity. 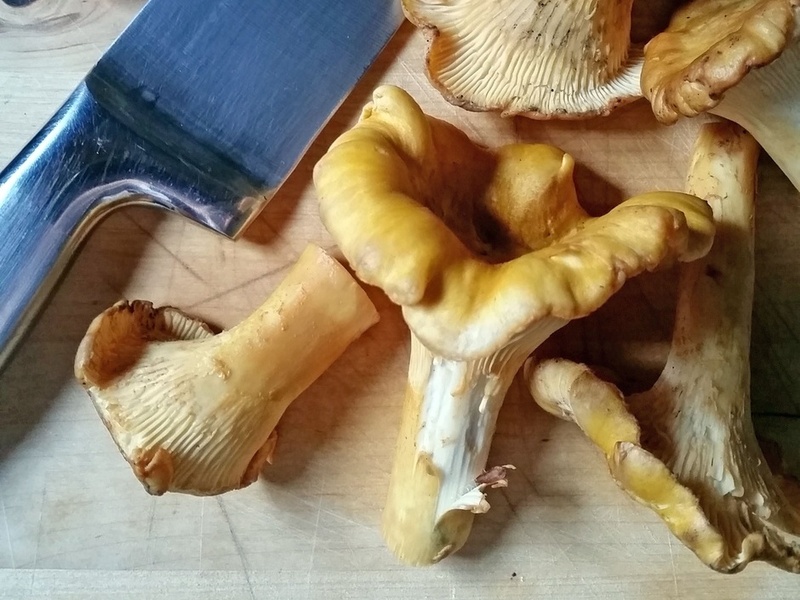 As I mentioned, you’re going to want to get your hands on Harbour’s Field Guide to Edible Mushrooms of the Pacific Northwest (HERE). At only 8 bucks, it’s the best insurance policy you’ll ever buy. It’s basically a large piece of laminated paper (that folds up and you keep in your pocket) with info on what kind of mushrooms you’ll be finding and how to identify them. When in doubt, do NOT eat the mushrooms you find out there unless you’re absolutely sure what they are. Luckily there aren’t any poisonous ones that look like chanterelles so it’s hard to mistake these beauties. Preparing chanterelles is a snap; fry them up in butter and serve over pasta (as we did below) or get fancy with them. I’ve written quite a bit about how awesome Bodega Ridge Resort is over the years, and that’s where we stayed while I went out and gathered the photos (and mushrooms!) in this feature. HERE are a bunch of posts about them; one thing to note is that they’re just a few minutes drive away from the head of a decent chanterelle patch and if you’re lucky they just might share it with you when you stay there. Fall and winter is my favourite time to travel in BC so stay tuned as I take you to more destinations, and share more tips, in the coming months. Next articleMetal Dog’s Butoh Style Performance of “Gong”.